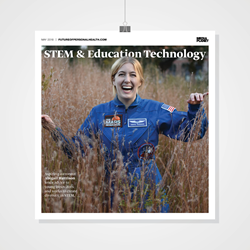 The Mediaplanet STEM and Education Technology campaign, found within USA TODAY and online, sheds light on the importance of investing in STEM education, in and outside of the classroom. Recent federal data show that half of American high schools don’t offer advanced math courses and more than 60 percent of high schools with large populations of African American or Latino students lack advanced math. Ahead of several key education conferences this summer, Mediaplanet today announces the launch of its June edition of “STEM and Education Technology.” This campaign dives deep into several key issues affecting equity in education and access to STEM learning resources in thousands of schools and communities across the nation, spotlighting leaders in education, after-school programs, and industry who are nurturing STEM learning both in and outside of the classroom, as well as providing support to educators and students to strengthen the STEM career pipeline. Joining us in this fight is the National Math and Science Initiative, a national organization whose mission is to advance STEM teaching, learning and college readiness. But how exactly is the NMSI tackling access and equity to STEM learning for these students? Since the launch of its STEM Desert campaign in 2017, the National Math and Science Initiative has been building a tool for schools and parents to gather insight on learning conditions using data and research, all to better identify whether their students are learning in a STEM hotspot or STEM desert. Behind the NMSI’s initiative to eradicate STEM deserts stand various leaders and education advocates, such as 100Kin10 and SRI International. For now, parents, educator, and administrators, can do their part to identify STEM deserts with these helpful tips. The print component of “STEM and Educational Resources” is distributed within today’s edition of USA Today in Chicago, San Francisco, Houston, Seattle, Boston, New York and Washington DC/Baltimore markets, with a circulation of approximately 250,000 copies and an estimated readership of 750,000. The digital component is distributed nationally through a vast social media strategy and across a network of top news sites and partner outlets. To explore the digital version of the campaign and more stories, click here.